Well, I was thinking what to write about this meal, but couldn’t get any idea. Then I was thinking of the origins of this meal and it happened that I found out about it in the Polish cooking magazine called Salt & Pepper. That thought brought me back to 2005 to the mad dash we had to do to travel 500 km to cross the border with Czech Republic so my at the time Cookies the Fiance could have a stamp in the passport. We went to my late Godfather living in the Kotlina Klodzka, who took us to the Czech… we stayed with him and his wife for few days between Christmas and New Years. And his wife was always collecting recipes, magazines being the DIY person she had plenty of different stuff and I found this Salt & Pepper cooking magazine on her table. I liked it so much, that I started collecting it and doing it until today. 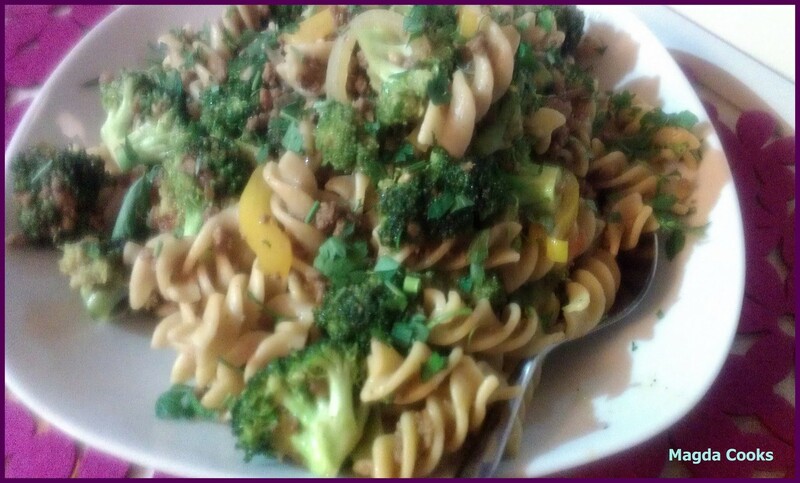 In one of the first ones I purchased I found this great recipe for penne rigate with broccoli, pepper, tomatoes and ground beef. I changed it a little bit and today I present my own version of it. Usually I make it with penne rigate but this time I had whole grain rotini. Boil pasta along the users manual. 0_o Then prepare all the veggies. Chop onion into tiny cubes, divide broccoli into bite size florets, cut pepper into strips (if you know how to julienne it… good for you 0_o). Cut the skin on tomatoes cross way on top and put for 20s into water boiling for pasta, then peel the skin off (you can leave it but while cooking in the meal it will separate and make the dish yuckie). Cube tomatoes in just chunks. Heat big pot on high fire, pour oil, and toss onion, fry fast for like 30s then toss meat in. Fry together until no longer pink. 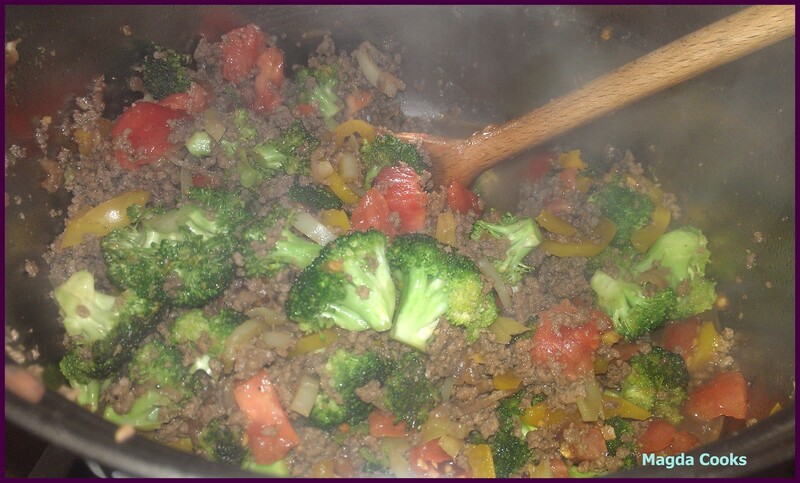 Add soy sauce and other spices, toss broccoli and pepper, cook for 5 minutes stirring often. If broccoli didn’t soften at this time, cook another 2-3 minutes. Then add tomatoes. Cook another 2-3 minutes until yummy juice shows. Toss pasta in and stirr good. Serve good portions with chopped parsley on top. Optionally you can use ketchup already on the plate or add while cooking ;-). The dish tastes good also with mushrooms and different veggies. P.S. Cookies thoughts: I actually have to beg her to do it, cause, well, she despises anything that resembles “Stir Fry” and while this meal is NOT a traditional stir fry, PER SE, it does have some roots in it, regardless I absolutely love this, and really Magda Cooks… It Just Right!